In 2017, Sony released no less than eight Xperia smartphones, from affordable to expensive models, and it looks like the company has similar plans for this year. While many fans are probably waiting for Sony's 2018 high-end phones (which should include an Xperia XZ2), we're now going to talk about the mid-range Xperia XA2 and XA2 Ultra, and the lower-end Xperia L2. We've already seen leaked images showing the Xperia XA2, XA2 Ultra, and L2. However, now, thanks to Venture Beat, we can take a look at press renders of the new handsets - most likely, Sony will use these to promote the three phones once it announces them. Unlike last year's Xperia XA1 and Xperia XA1 Ultra, which are powered by MediaTek processors, the XA2 and XA2 Ultra will feature octa-core Qualcomm Snapdragon 630 chipsets. Both handsets should sport 1080p screens in different sizes: 5.2 inches on the Xperia XA2, and 6 inches on the Xperia XA2 Ultra. The Ultra model should come with a dual 15 MP front-facing camera (with 4K video) and a 21 MP rear camera, while the regular XA2 will have the same rear camera, but only a single 7 MP shooter on the front. The Sony Xperia L2 may be powered by a Snapdragon 630 processor, too, though its screen is expected to be a 5.2-inch one with just 720 x 1280 pixels. All three new Xperias have fingerprint scanners on the back, in a first for Sony smartphones. Apparently, only the XA2 and XA2 Ultra will run Android 8 Oreo out of the box, while the Xperia L2 is expected to be launched with Android 7 Nougat on board. 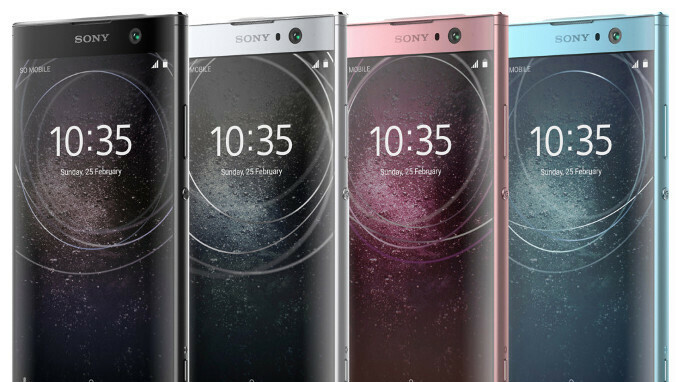 Sony will almost certainly announce the Xperia XA2 series and the Xperia L2 in the near future - either at CES 2018 (January 9 - 12), or at MWC 2018 (February 26 - March 1). Stay tuned! The new flagship in MWC will bring new design and new naming scheme. Yeah definitely 2012 with bulletproof bezels. And yet still smaller bezels the Apples iPhone 8 models released 2 months ago. Yup, no battery issues since 2012. The XA2's have a slight oval curvature screen and back which is just bloody awful imo. I hate edge screens but this is actually worse. I'm pulling for Sony but if they do this with the flagships, they're done. Rear fingerprint scanner is really bad idea. I have a phone with rear fingerprint scanner and it's definitely not as convenient as front or side placement of scanner. Somehow brands do not understand that. And if they do, they just do not care. They only want our money. Only brands who really want to establish themselves might try to listen to the consumers and give them what they want, sometimes through online feedback. Others like Samsung will just ignore all that mess and do what they think is required for maximum profits. See Razer? They built a great phone on their first try, and for an okay price. Proves that in-established brands more often try to please their customers than established ones. XA series has no side bezels, except XA1+. No space enough. Apple has now patent of power as FPS. This must be the way Sony has to enable in USA/Canada. For some reason, the back looks like the old Sony Ericsson Xperia series.